Pod is back for a second adventure in the Stone Age. Be prepared for some amazing revelations! When you first pick this children’s book up you know it’s going to be a funny adventure. I definitely wasn’t wrong as my daughters giggled all the way through while Pod tried out some very interesting underpants. Children just find anything about bottoms and pants funny, and it’s a sure fire way to get them hooked on a story from the very beginning. Pod has a problem, it’s pretty cold during the stone age and he wants something to keep his bottom warm while he’s running and playing with his friends. Whilst this is a funny topic the story is actually exploring some really interesting ideas as well. Pod starts to use the materials around him to make a pair of underpants to keep his bottom warm. By experimenting with the things he finds around him he learns a about making underpants and it’s all about whether he finds a solution. I’m sure that a real stone age Pod would have gone through a similar process to come up with ways to solve problems he encountered so we were really impressed with this book. It gave us lots to talk about what life would have been like back then. When you live in the Stone Age, it can get very cold… so cold, in fact, that you might need a good bottom warmer! Never one to sit around feeling the chill, young Pod decides to find himself some cosy underpants but where do you find them when everyone’s stony broke for warm materials? 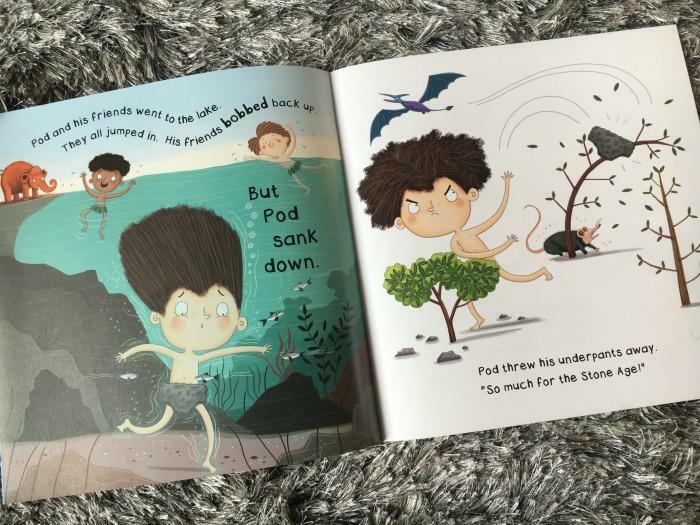 Young fiction writer Rebecca Lisle makes a triumph of going ‘bottom up’ in her first picture book which explores – in the most delightful way – the freezing but funny side of the Stone Age. Pod doesn’t like having a cold bottom so his dad very helpfully suggests he makes some. And Pod works really hard to solve the problem… but stone ones are too heavy, wooden ones are too splintery, shells too clattery and feathers too ticklish. It’s only when he sees the woolly mammoth’s warm coat that his ideas start to knit together something truly toasty warm… Richard Watson provides the wonderfully colourful and characterful illustrations for a charming picture book brimming with invention, imagination and Stone Age innovation! When you live in the Stone Age, life can be decidedly chilly… especially around the bottom! So ingenious Pod decides to make something to solve the problem – underpants. But stone is too heavy, wood is too splintery and none of his other ideas work either. Finally, he finds the perfect solution – and a whole new Age comes to be. This hilarious story is gloriously illustrated by Richard Watson with some fabulous details like the ‘cave paintings’ in Pod’s bedroom. A wonderful story. November 2016Rebecca Lisle has written some fantastic books for young and older readers but this is his first picture book, and it’s a gem.The story is very simple. We’re in the stone age. Pod wants to go our and play with his mates but it’s too cold to venture out in his birthday suit. His parents suggest he could make himself a pair of undies. He tries various materials, including leaves, feathers and wood but nothing work until he has a brainwave: stone underpants.Rebecca tells her story in a funny, direct style that compliments Richard’s bright, cartoony style. This is a great, endearing little book that will have children in giggles, and would also work well in a classroom when doing the ‘stone age’ as a topic.Reviewed by Saviour Pirotta. Thanks for the 5/5 Madhouse Family!! Review from Letterpress Project: Click here to read the review online. When Sparrow reaches age 11 she has to leave the Knip and Pynch Home for Waifs and Strays. She sets off to find out who her family are – with only one clue, an old and lovely baby blanket. Luckily she isn’t alone, she’s accompanied by her amazing Scaramouch … a very special cat. Sparrow travels to the town of Stollenback. She is taken in by Gloriana, a strange and colourful street girl. Sparrow thinks she has found a home in the ‘nest’ – a hideout for homeless girls run by the beautiful but menacing Miss Minter. And she feels at ease there, and quite content with her life compared to that in the orphanage, but all is not as it seems; the horrible Tapper is on her trail and plans to sell her for a great deal of money. A wonderful re-imagining of OLIVER TWIST for younger readers, Sparrow’s adventure realises the dark secrets of Dickensian London with a fantastical twist. Read a review here at Thoughts About Books. Stormy is an orphan and a kitchen skivvy. He tends the compost heap, scrubs the floors, and peels the vegetables in the huge kitchen run by scary Otto, the cook.